Radios are miscellaneous items that appear in the Portal series, and appear as simple analogue AM/FM radios set to 85.2 FM. Radios are introduced at the very beginning of Portal, and also make a brief appearance in Portal 2. When Radios are encountered, they are usually switched on and play an up-tempo version of the tune from the end of Portal ("Still Alive"). The Radios in Portal did not originally serve any obvious purpose, and appeared to be present merely in order to provide ambiance. The March 1, 2010 patch however, added 26 additional Radios to the game, most of which were hidden in Test Chambers, and also added a new achievement, "Transmission Received". This patch, its accompanying achievement and patch notes were later revealed to be part of the Portal ARG. Among other things, the patch altered the Radios so that they would emit a Morse Code-like signal when placed in certain locations within a test chamber, and locating all 26 of these areas was required in order to unlock the achievement. 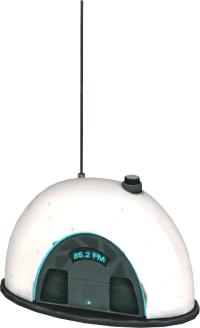 Radios do not play a large role in Portal 2, and appear only twice, both times in Chapter 2. In Chapter 2: The Cold Boot, Test Chamber 3, a Radio can be found in the corner of one of Ratman's Dens. Instead of playing the usual up-tempo tune, the Radio plays The National's Exile Villify, only once, for its full length. In the same chapter, in Test Chamber 6, a Radio can be found among the "garbage" that is ejected from the Vital Apparatus Vent, and is necessary to complete the "Final Transmission" achievement. This page was last modified on 6 February 2018, at 05:31.